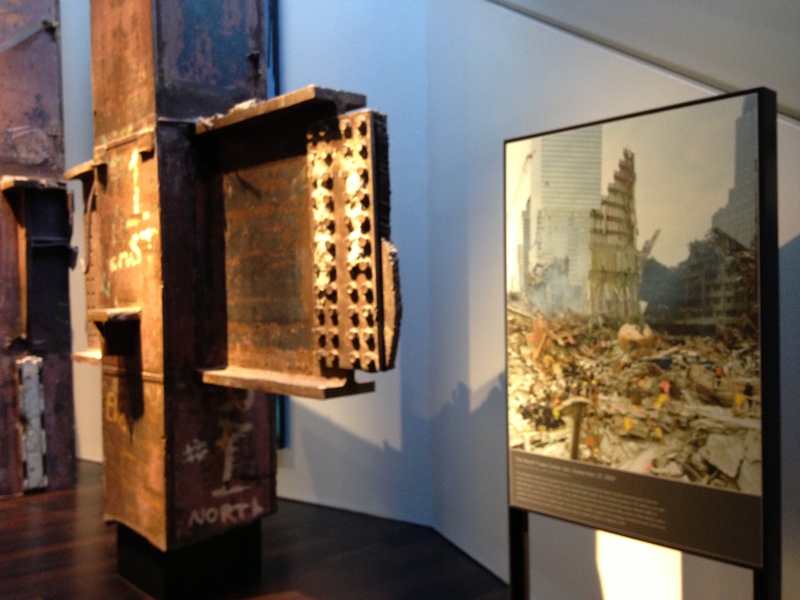 Today the original World Trade Center site sits as a memorial dedicated to all who lost their lives. A new museum spanning four stories underground recently opened with a time-line of events and artefacts from the day to honour the memories of the many people killed. From a scene of complete ruin and devastation has now raised a stunning piece of architecture with the new World Trade Center building. Having worked in the airline and travel industry for the past 15 years, this event touched me personally and deeply. To this day scenes captured on film stir an emotion from deep with-in. 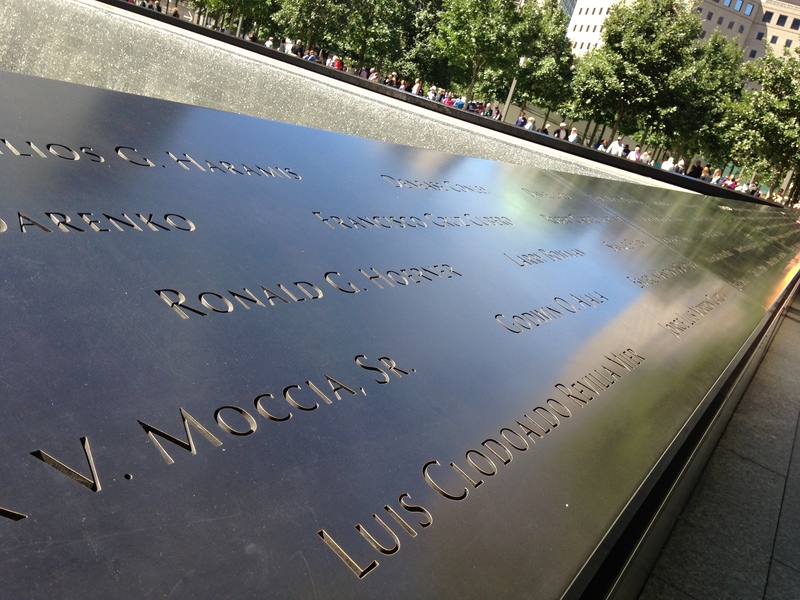 While on a recent business trip to New York I needed to pay my respects and visit the new memorial. 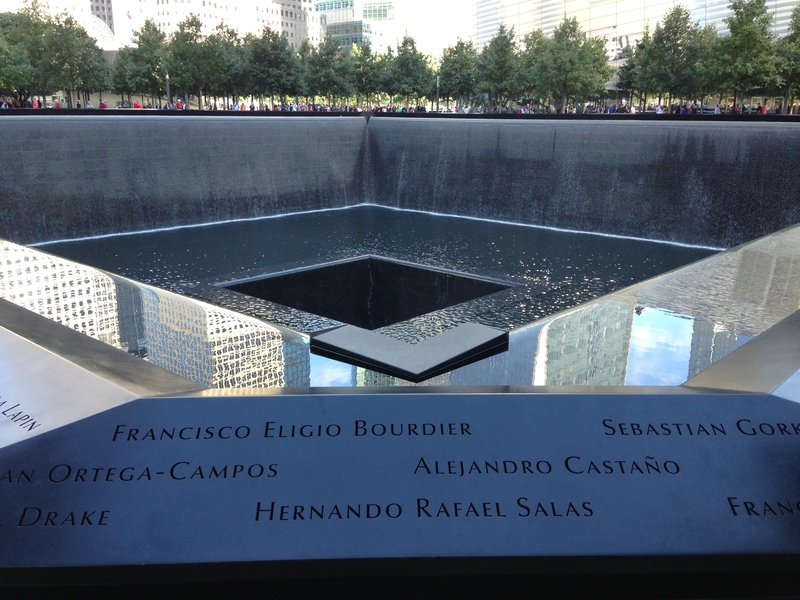 While not my first visit to the 9/11 memorial, this was the first since the museum opened. Like many people around the world I remember the day vividly. In fact we had flown on United Airlines (one of the two airlines that lost aircraft that day) from Chicago to Paris on September 9, just two days prior to the tragic events. We had hailed a taxi to make our way from the Paris Opera House to Sacre-Coeur when in French we listened to the story unfolding over the radio station. While not able to speak French but through a dialogue of broken English and hand gestures with the taxi driver we soon realised that something enormous was taking place. We quickly found a public pay-phone to call back to America for confirmation. We had issues in securing a phone connection between the two countries with several attempts required before success. With the French news report confirmed, we quickly jumped back into a taxi and headed to our hotel. Like millions of viewers world-wide, we watched the day’s events unfold in a silent disbelief. What started as a 10 day holiday to enjoy both France and Switzerland was suddenly interrupted by terrorist activity. I arrived at 1030am before my guided tour at 11 to explore the grounds. It was Sunday, 14 September and the crowds were out early on a beautiful New York City day. The memorial grounds which were originally ring-fenced off with tight security with a pre-booked pass required to enter are now open grounds for all to visit. The memorial gardens cover a city block of the original World Trade Center with trees and grassed areas surrounding the large pools where the footprints of the towering buildings once stood. Well maintained and preserved, the area is a fitting tribute to the nearly three thousand lives lost. Etched into the square edges of the memorial pools are the names of the lives that were lost from the September 11 attacks and the underground car-park bombing on 26 February, 1993 (the first attack of the World Trade Center) where 6 people lost their lives and over 1,000 were injured. 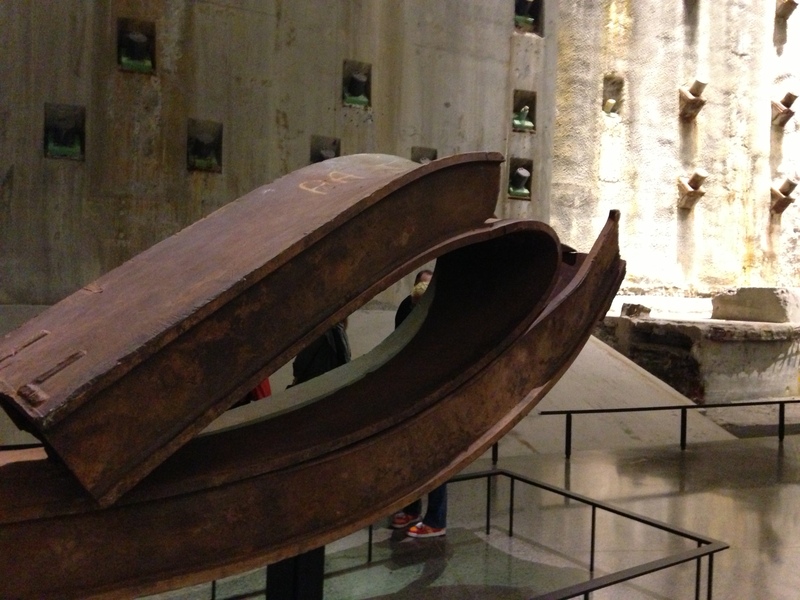 Upon entering the museum, visitors are greeted with a pair of large ‘trident’ steel columns that formed the base of the buildings unique structure prior to making their way down stairs. Here either the paid guided tour starts or the self-guided tours can commence at any time. The tour started with a photo taken of the lower Manhattan skyline from across the river in Brooklyn around 0830am, approximately sixteen minutes prior to the first aircraft (American Flight 11) hitting the first tower at 0846am. Immediately notable in the photo is the clear blue skies and visibility of what looked to be the markings of a beautiful New York City day. We were then taken through a series of video walls with voice accounts reflecting on the day. Making our way to the next level down we pass the ‘survivor staircase’ which was one of the several stair wells many people escaped from. 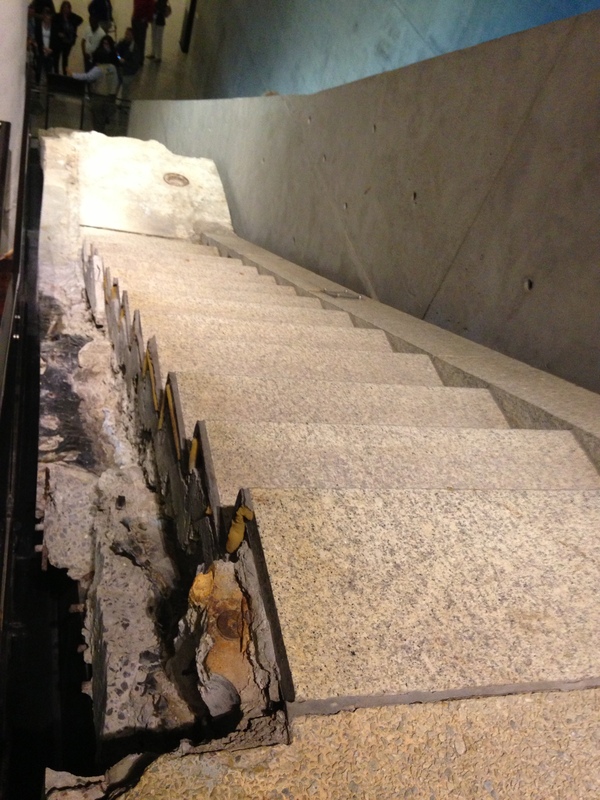 The bottom edge of this staircase is severely damaged from when the building collapsed. A large room with the original outer walls still in-tact is entered where the last column to be removed from ground zero takes center stage. 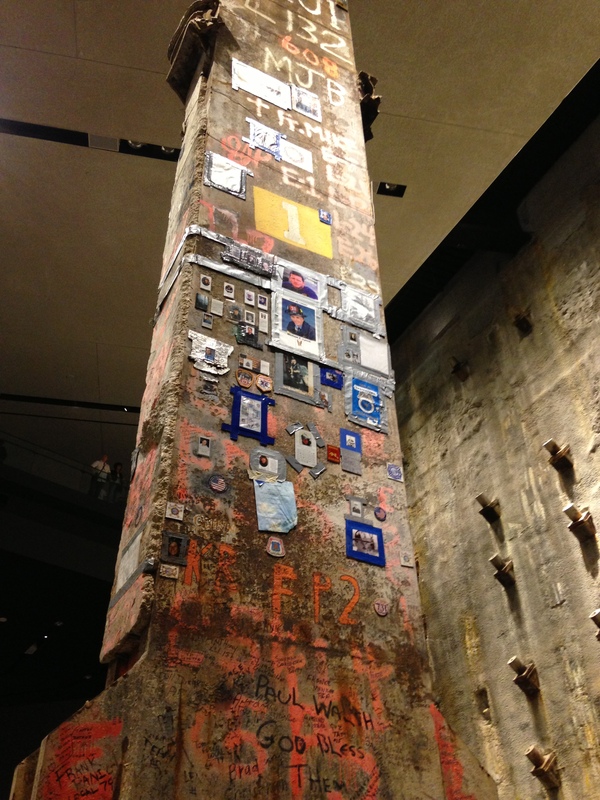 This is one of the most recognised symbols of 9/11, covered with graffiti from the site workers and rescue teams. 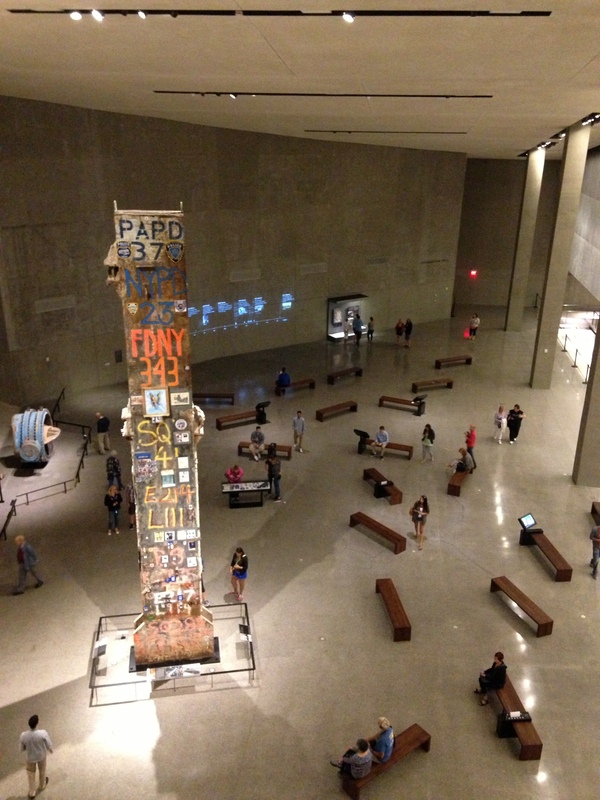 This column become a symbol of remembrance and is visible from several levels. 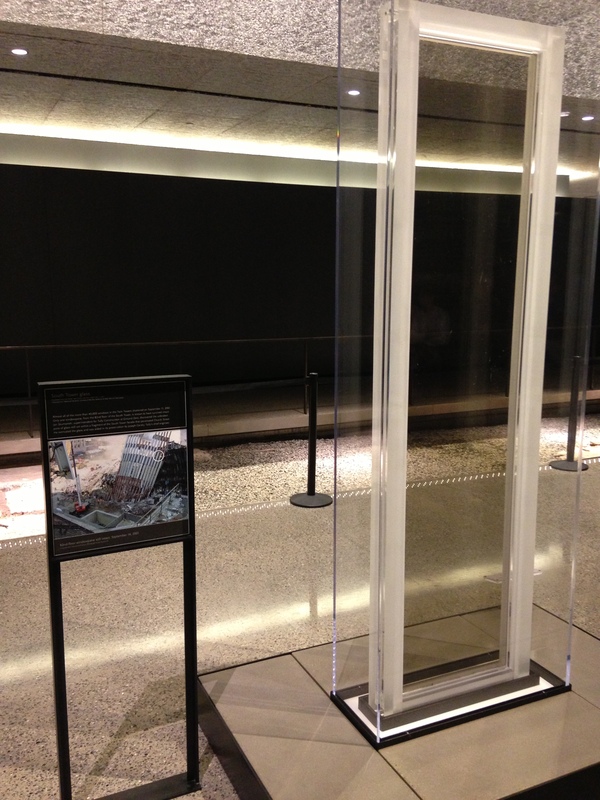 I was struck by one particular exhibit which was a pane of glass from the 82nd floor of the south tower that had survived both the initial impact and the collapse of the tower. 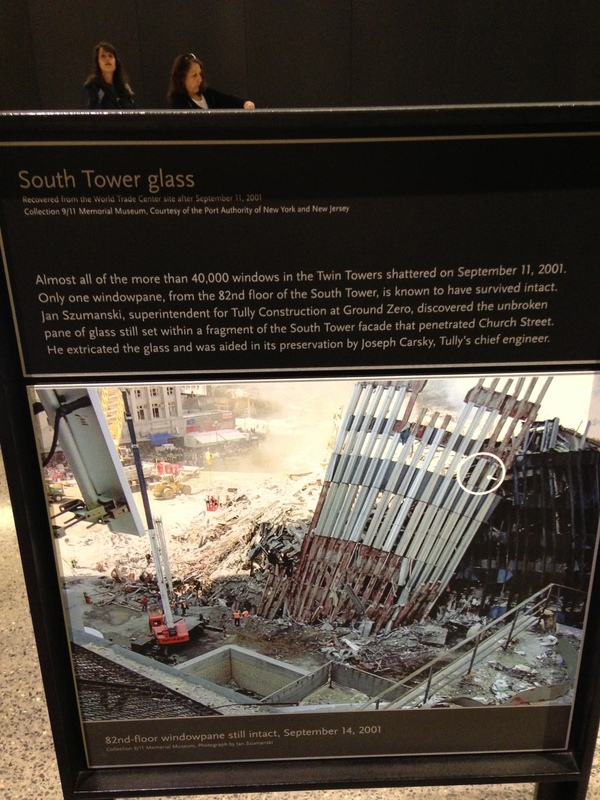 Amongst all the destruction of that day, to see a pane of glass that was untouched and in-tact seemed quite remarkable. 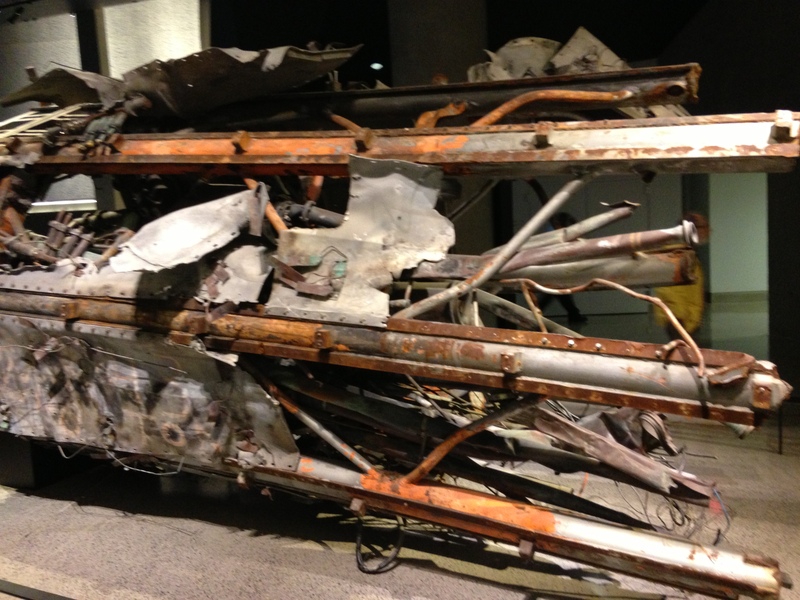 Moving to the next exhibit, resting below the north tower memorial pool above, was the remnants of a portion of the radio tower recovered from the rubble that sat on top of the north tower. Next to the radio tower was an elevator shaft motor also recovered from the rubble. 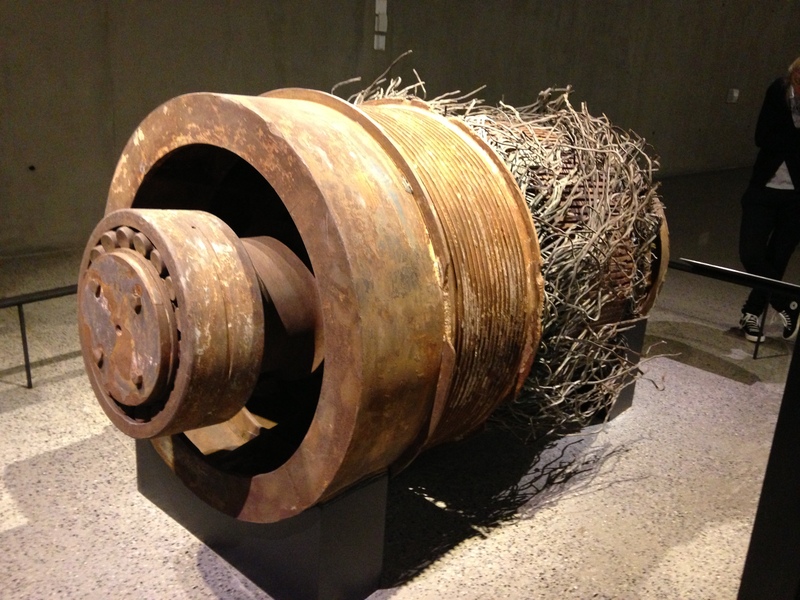 The motor was most likely from one of the express or service elevators from inside the north tower. 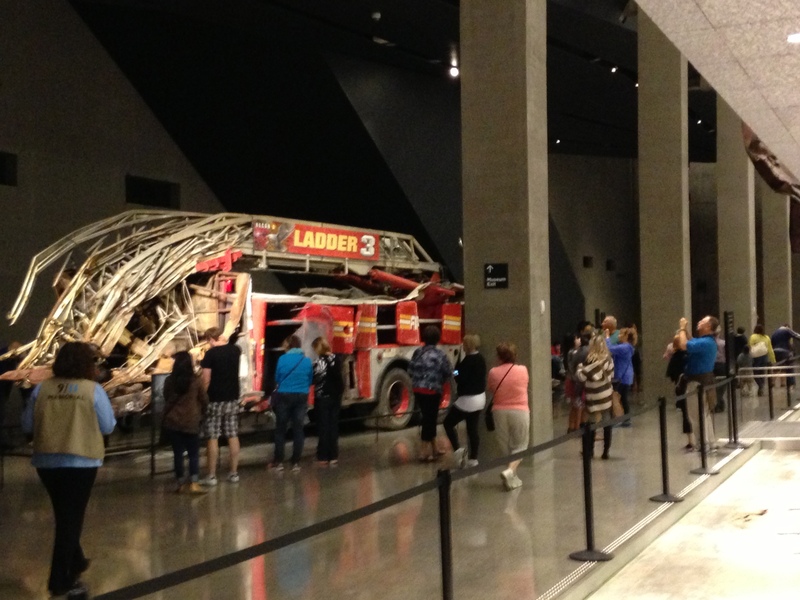 One of the largest displays of wreckage included the New York Fire Department Ladder Company 3 fire truck. This truck was based in the East Village neighborhood and was one of the first dispatched to the World Trade Center which parked on West Street, near Vesey Street. 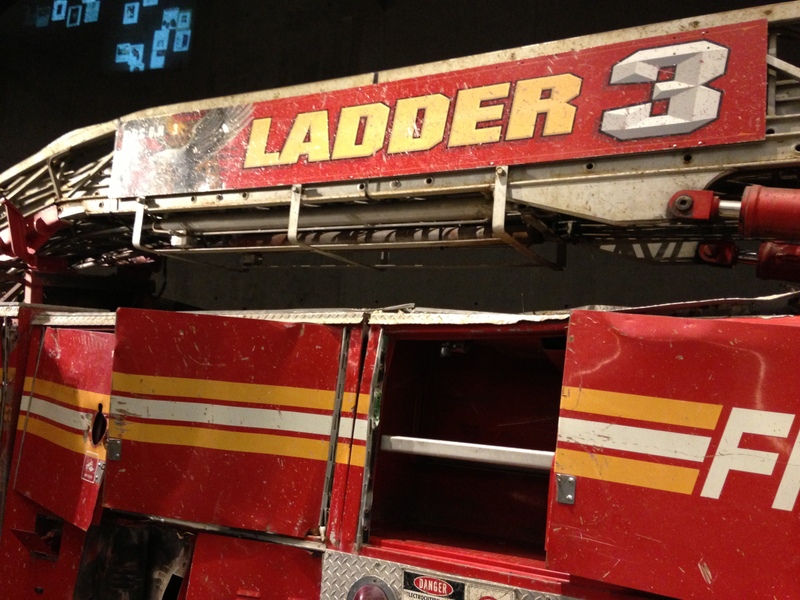 At the time of the building collapse, the front part of the truck was parked underneath a pedestrian walkway which collapsed on top of the front end of the fire truck when the towers fell. 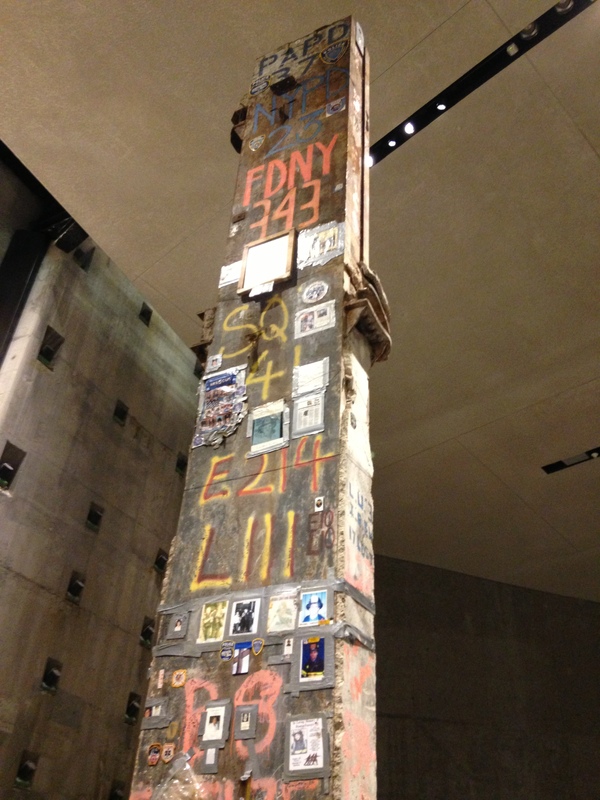 One of the recovered south tower columns, most likely between floors 30 to 33, had folded over itself during the collapse of the building due to the immense forced stress and weight of the building collapse. 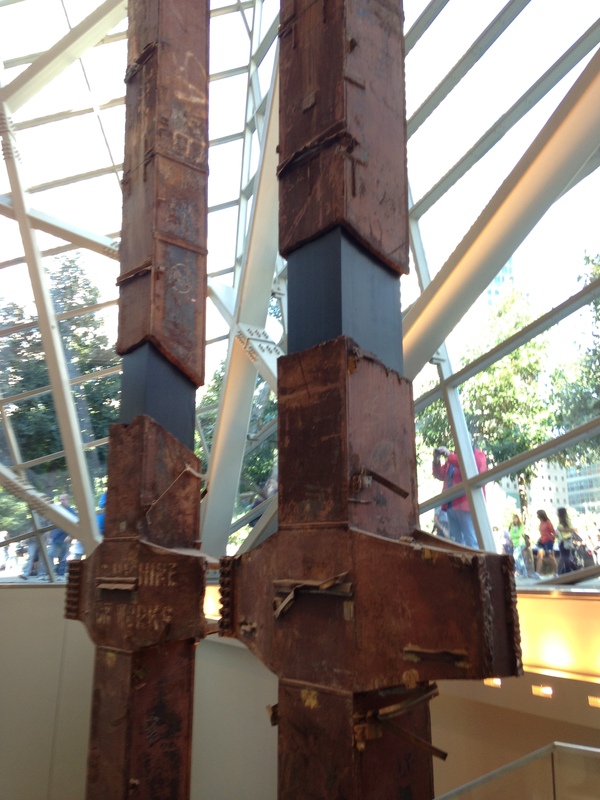 Three of the four welds that held the column together had split open. There are several other exhibits housing a countless array of artefacts. Unfortunately photography was not permitted inside. These were self-guided exhibition halls which walked you through different events of the day including a dedicated area for both the Pentagon and Flight 93 Pennsylvania tragedies. Inside the historical expedition three parts are covered; the day of 9/11, before 9/11 (the background leading up to the events) and after 9/11 (examines the aftermath and continued implications). Inside this exhibition the lives of the nearly 3,000 people that were lost are commemorated by the “Wall of faces” along a corridor with portrait photographs of every victim. The exhibit is designed to communicate the scale of human loss. Touchscreen tables offer additional information of each person which include photographs and audio from family, friends and co-workers. 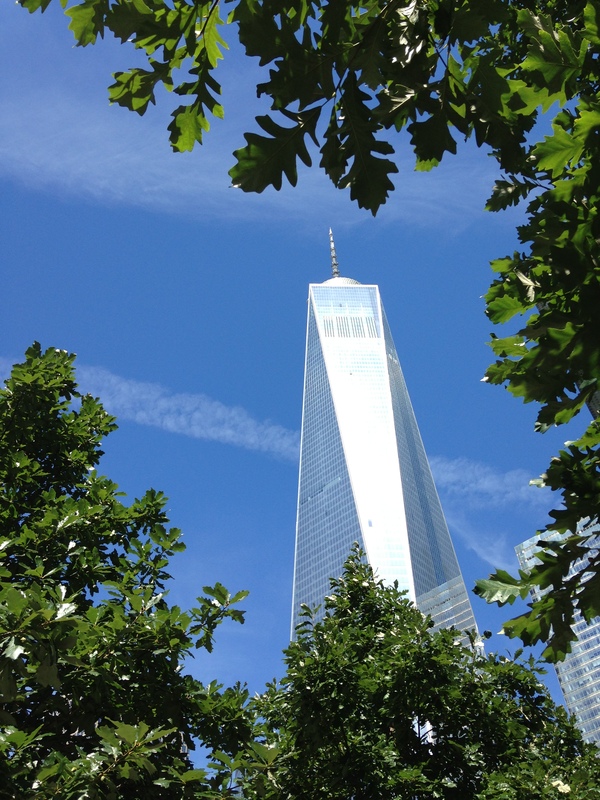 Colloquially referred to as ‘Freedom Tower’, the legal name of the 104 storey building is One World Trade Center. 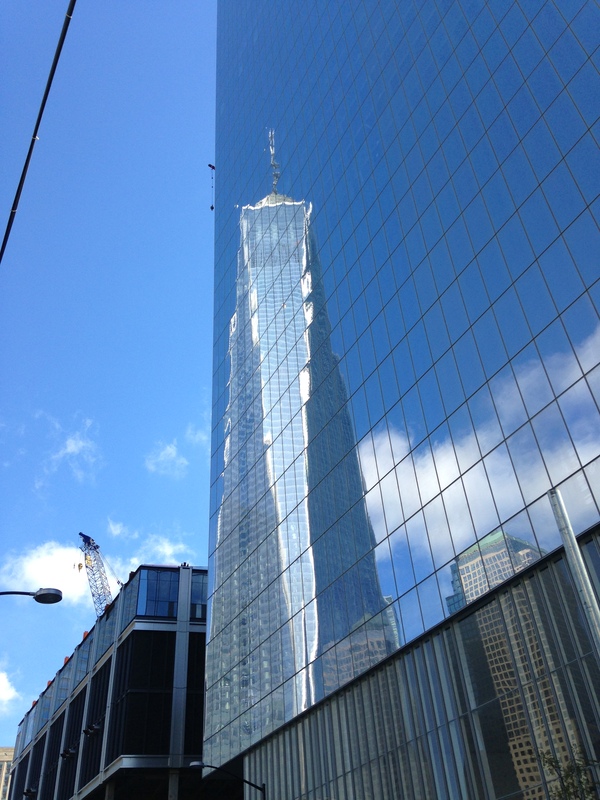 Located on the original site of Six World Trade Center, the reflecting glass building is officially the tallest building in Manhattan and fourth tallest in the world. 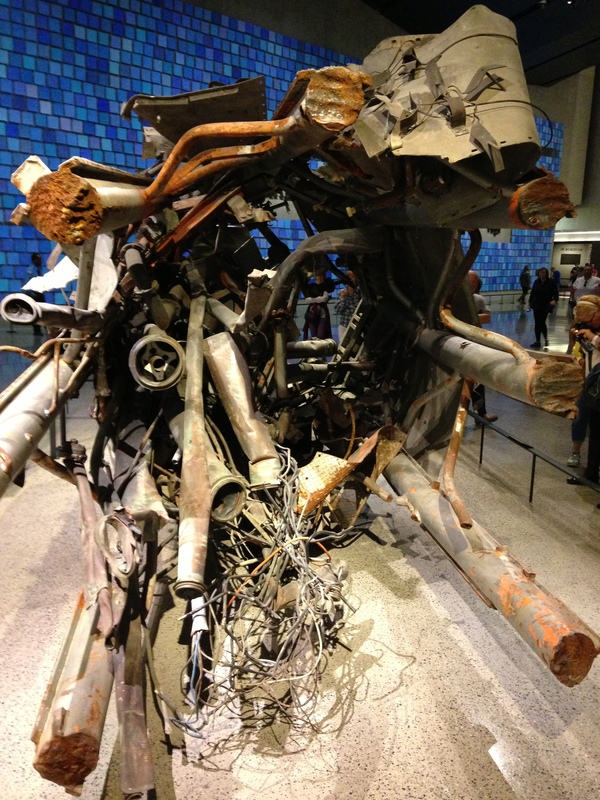 This memorial is tastefully done and serves as a reminder of the senseless terrorist attacks of 9/11. I did struggle through certain sections of the museum and was not able to visit every exhibition. I found it very emotional and hard to view some of the artefacts such as parts of aircraft, ID’s of people who had lost their lives and some of the images and audio are very confronting. Some displays show a warning sign prior to entry due to the graphic contents inside. I do recommend visiting this museum and I will one day return. As a caution, some exhibits are very distressing and confrontational with several visitors on my tour displaying raw emotions. 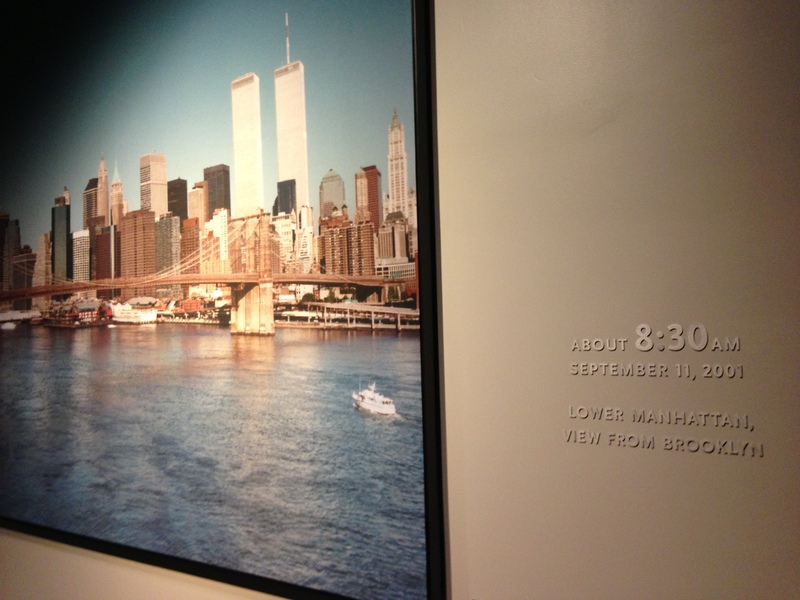 There are graphic scenes, images, audio and artefacts that make up the museum. HOT TIP: But your tickets online prior to visit as the lines and wait times can be great regardless of day of week. I would recommend the guided tour as it gave a great perspective of the museum and back ground information. Our guide Matt was very knowledgably and understanding. 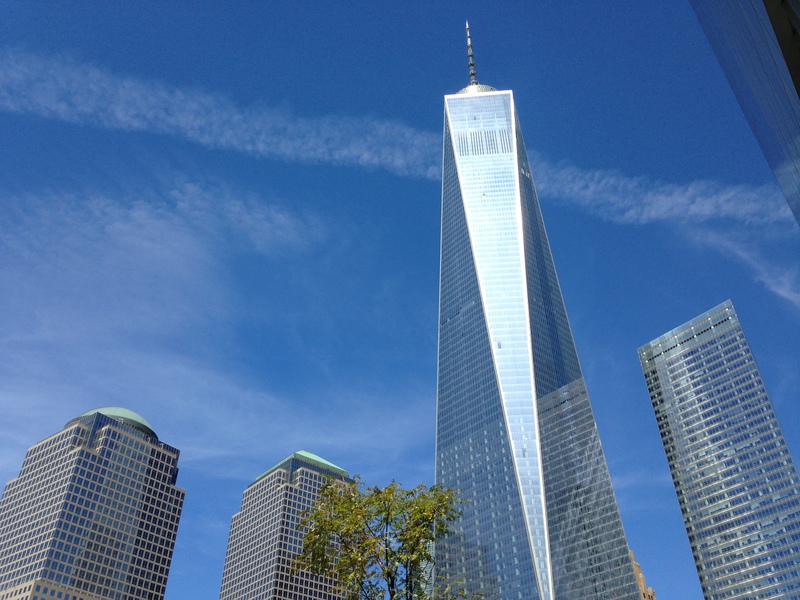 Located in lower Manhattan, the World Trade Center memorial and museum are at the intersection of Liberty Street and Greenwich Street, intersection of Liberty Street and West Street and the intersection of West Street and Fulton Street. Simply look up to easily navigate. Public transport is recommended as access to lower Manhattan can be restricted. The PATH train serves the World Trade Center terminal from multiple points in New Jersey. If traveling by car from New Jersey or other points west, the Harrison PATH station is a convenient location to park in an adjacent parking facility and take PATH to the World Trade Center. Ferry service is available from Midtown Manhattan, New Jersey, Brooklyn, Queens and Staten Island. Lower Manhattan is difficult to navigate by car, and on-street parking is extremely limited. The Memorial does not provide parking. If traveling by car from New Jersey or other points west, the Harrison PATH station is a convenient location to park in an adjacent parking facility and take PATH to the World Trade Center. The following is a list of garages available for parking. 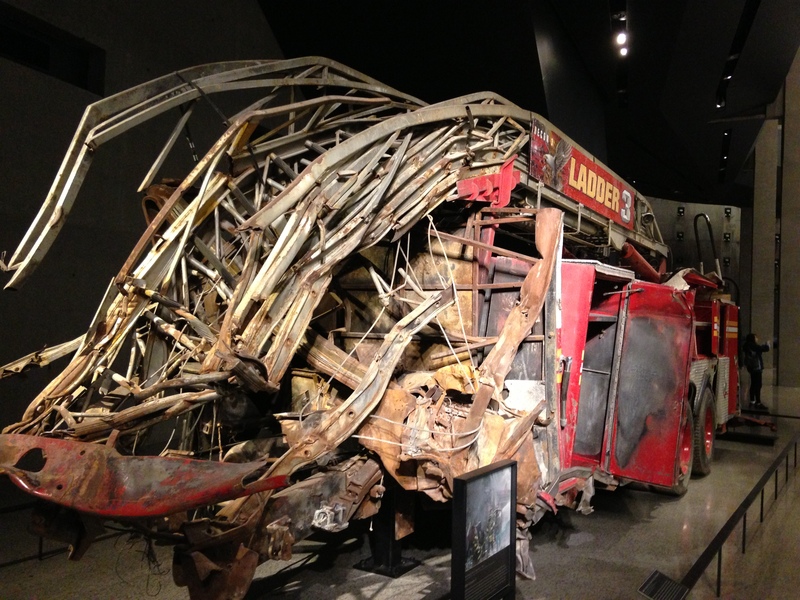 The closest taxi stands to the 9/11 Memorial and Museum are located on West Street and Liberty Street and on Vesey Street at West Street. Thanks for the mini tour of a most memorable day.